Using aviation industry ads, a new book revisits a time when outer space still thrilled, and cold war paranoia reigned. In the pages of magazines like Aviation Week, Missiles and Rockets and even Fortune, companies, some famous and some now obscure, were engaged in a sort of leapfrog of dreams. And so, for example, Republic Aviation of Farmingdale, N.Y. — “Designers and Builders of the Incomparable Thundercraft” — could be found bragging in Aviation Week and Space Technology magazine in 1959 about the lunar gardening experiments it was doing for a future Air Force base on the moon. Or the American Bosch Arma Corporation showing off, in Fortune, its “Cosmic Butterfly,” a solar-powered electrically propelled vehicle to ferry passengers and cargo across the solar system. Most Americans never saw these concoctions, but now they have been collected and dissected by Megan Prelinger, an independent historian and space buff, in a new book, “Another Science Fiction: Advertising the Space Race 1957-1962.” It is being published on May 25 by Blast Books. Ms. Prelinger and her husband, Rick, operate the Prelinger Library, a private research library in San Francisco with a heavy emphasis on media, technology and landscape history. The book, she said, was inspired by a shipment of old publications to the library, including Aviation Week & Space Technology and Missiles and Rockets. “I little expected that the advertising in their pages would seize my attention more than the articles themselves,” she writes in the introduction to her book. The ads are chock-full of modernist energy and rich in iconography in ways Ms. Prelinger is happy to elaborate on. The late ’50s were also the years of the Organization Man. The cover illustration, from an insurance ad, shows a man in a gray flannel suit who is a dead ringer for the existentially confused Don Draper of “Mad Men,” floating alarmed and bewildered among the planets and stars. Time and again, the mountains and valleys of the moon, for example, are portrayed as if they were the mountains, canyons and deserts of the American West, making the space program just another chapter in the ongoing narrative of Manifest Destiny. In one illustration, the hands of God and Adam from Michelangelo’s Sistine Chapel ceiling have been transformed into a giant pair of space gloves reaching for each other. In another, the silhouette of a spaceship forms a cross. Leafing through this book is a walk down my own memory lane. I grew up in Seattle, which was a one-company town dominated by Boeing. Almost everybody worked there sooner or later. My best friend’s father helped design the Saturn V rocket that lifted humans to the moon. After limping out of M.I.T. with a physics degree in the late ’60s, I, too, worked there for a year, playing a kind of space war — shooting high-speed aluminum balls at sheets of aluminum arrayed to simulate the structures of aircraft or spacecraft, to see what the damage would be under various conditions. At the end of the day, my desk was buried in piles of sharp dented and charred sheets of aluminum. I had to count all the holes. It’s hard to know what to be more nostalgic about, all those childhood dreams of space opera or the optimism of an era in which imagination and technology were booming and every other ad ended with a pitch to come work for the thriving company of the future. “To advance yourself professionally, you should become a member of one these teams. Write to N. M. Pagan,” reads a typical notice from the Martin Company, now part of Lockheed Martin. You don’t hear that much these days. Back then, you, too, sitting at a drafting table or in a cubicle, designing antennas or self-locking nuts among acres of such boards and cubicles — “Reaching for the Moon, Mr. Designer?” reads a Kaylock ad — could be a space hero. And of course it was almost exclusively men depicted in the ads. One exception was an ad from the National Cash Register Company for a new electronic machine for posting checks. 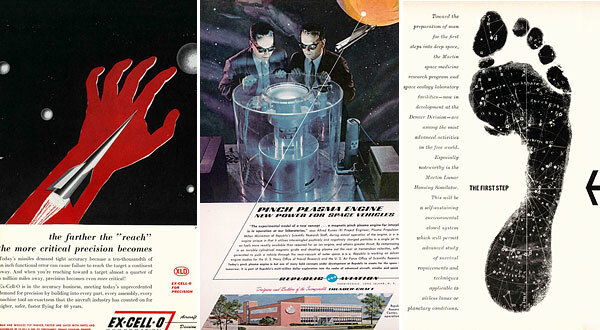 “And what the POST-TRONIC does electronically the operator cannot do wrong — because she doesn’t do it at all!” says the ad showing a woman floating in space at the machine’s console. Naturally, there was a hook to those recruitment ads, as Ms. Prelinger points out. The real business of most of those aerospace companies was not the space program but defense — building fighters, bombers, missiles and other implements of the cold war, not to mention commercial airliners. For many of these places, the space program was more of a hindrance than a boost to the bottom line, a sort of prestigious loss leader to attract cutting-edge talent. Occasionally, as Ms. Prelinger reports, the darker side of this work bled through into the trade press and the ads, like when the Marquardt Corporation, which made small control rockets for satellites, showed a spy satellite aiming its lens down at Earth. If the space fever began in 1957 with Sputnik, it cooled by 1962, when the basic plan for the Apollo moon missions was set and there was no more space for imaginations to run wild. Also, by then NASA’s budget was leveling off. Ms. Prelinger said that during this period about half a million engineers, scientists, draftsmen and other people followed the clarion call to blend their talents into the new age, swelling the ranks of aerospace workers to more than a million. Some of them might have wound up like me. When the “impact mechanics” group was downsized, I was sent to the “weights and measures” group. Our job was to scrutinize rocket blueprints to determine the position and weight of every nut, bolt, washer and any other item on a small upper-stage booster that was to deliver an unknown payload to orbit. The information could be entered into a computer program that would calculate the center of gravity and other dynamical properties of the rocket package. It was essential but brain-numbing work, and I learned a lot about shooting rubber bands from the wars that broke out every day after lunch. But it was men and women like these, working in cubicles, who saved the astronauts of Apollo 13 in 1969, by figuring out how to bring them back from the moon alive in a crippled spacecraft. In the wake of the moon landings and then the end of the cold war, many of those jobs, exciting or not, disappeared, as did many of the companies that advertised them. What has not disappeared in all these years and decades is the yearning and arguing about space. We’re still fighting about what NASA should do as far as human exploration of the universe is concerned, collectively looking more and more like that bewildered advertising man floating in space on the cover of Ms. Prelinger’s fascinating book. The argument has been going on for my whole life. Since those advertisements appeared, the United States invaded Vietnam and left; the Soviet Union crumbled and China rose; the whole nation stopped smoking. We never did find the essence of infinity — at least not yet. This entry was posted on Monday, March 8th, 2010 at 11:10 pm	and is filed under News. You can follow any responses to this entry through the RSS 2.0 feed. You can leave a response, or trackback from your own site.